If you have paintball on the brain, than this will be music to your ears. We know that it is at times difficult to maintain energy levels when in the thick of the action, eliminations become all too common and paintballing performance can quickly drop. So if you find yourself beginning to tire and in need of a psychological boost, what do you do? Press “play”, of course. 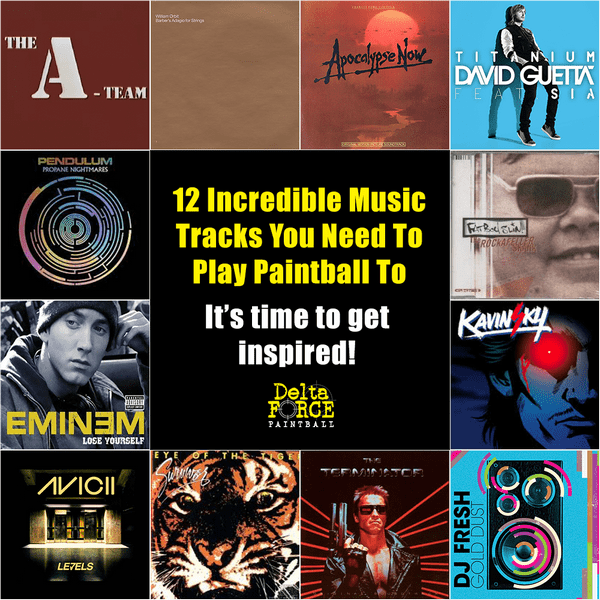 From iconic ‘80s movie soundtracks to the bass-pumping sounds of Pendulum, this rundown of 12 tracks is as crucial to securing victory as any semi-automatic marker, paint grenade or game-changing strategy. It’s time to get inspired! DJ Fresh kicks proceedings off with this upbeat track to get you in the fighting mood. The official video is pretty damn cool too. This one really taps into the fighting spirit; whatever impossible situation you find yourself in out on the battlefield, never give in till the final paintball is fired! A little predictable, perhaps, but this wouldn’t be a real motivational music list without it. Many cliché workout montages certainly owe it big time. These driving electro beats from the French producer Kavinsky will soon have you focused and ready for action. Just one of many epic bangers from the Australian/British drum-and-bass heroes well all know as Pendulum. Be careful not to actually think that you are made from titanium; false confidence may lead to quicker eliminations! Still, a real monster of a track, we think you’ll agree. 4. “Ride of the Valkyries” from Apocalypse Now SoundtrackRegardless of director Francis Coppola’s haunting interpretation of the Vietnam War, the stirring Ride of the Valkyries (originally composed by Wagner) perfectly represents the rush of imminent combat. Who says classical music is boring? Not much needs to be said about this one, except that it is guaranteed to become stuck in your head. Perfect really, as it keeps the adrenaline flowing over the course of your paintballing adventures! Getting pumped for paintball and trance music seems to naturally go together, and this dramatic classic from Will Orbit represents the very best of the genre’s halcyon days. The Mac Daddy theme tune of all theme tunes – no battle scenario should be entered without the familiar military drum beat and brass band accompaniment that symbolises the awesomeness of the A-Team. With this playing, it’ll almost be as if the boys are there with you as you unleash a full hopper of paintballs upon your fleeing foes!